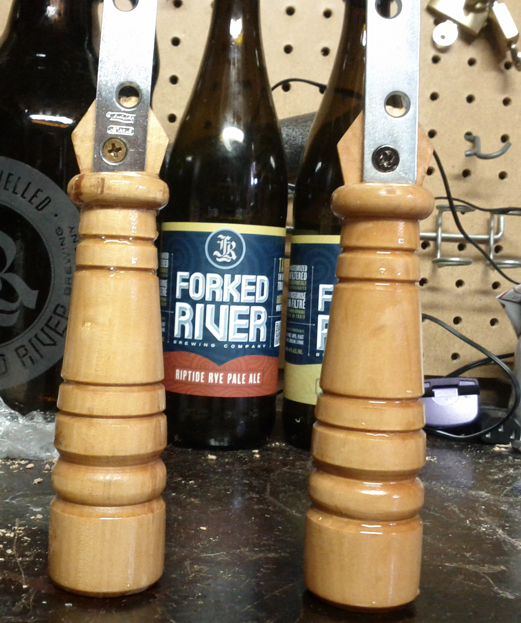 Over the weekend I built a pair of tap handles, based on a derivative of Revvy’s design. His design is quite innovative – a handle & frame supports a magnetically-attached collector card card protector. 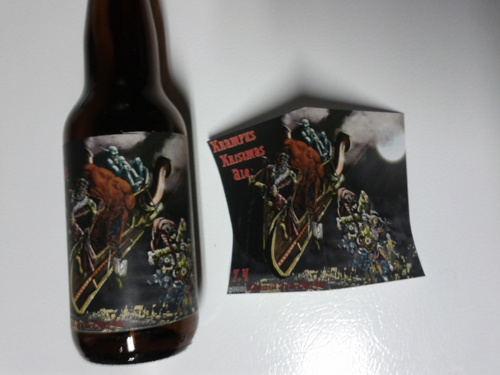 The label is inserted into the protector, thus labelling the brew. My design (picture to right) is based on Revvy’s, but is a little more svelte in design, easier to build, can be made for less than $10 each, and takes about 10 minutes to make (not including drying time). 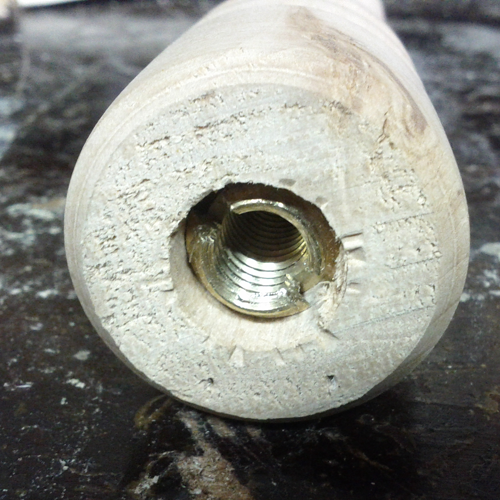 The design is simple – the centre pin of a pre-turned replacement chair leg is removed and replaced with a threaded insert which allows it to be screwed onto a keg post. A bit of the handle is cut away to allow a steel mending plate to be attached vertically to the tap – this holds the card protector/label in place via a strip of magnetic tape attached to the back of the card protector. 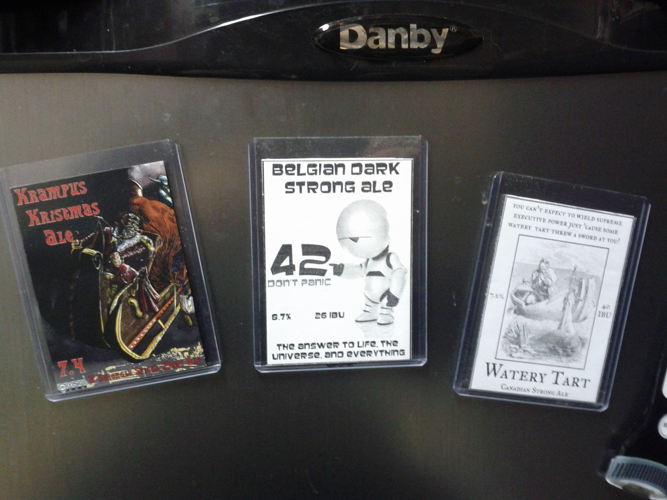 This has a number of advantages – aside from letting a label do double duty as both a bottle label & keg label, the labels from old batches of beer can be stuck to the keggorator/keezer – ala fridge magnets – allowing them to be reused and providing a bit of visual appeal to the fridge (and working as a reminder of the many magnificent brews that have passed through your kegs). 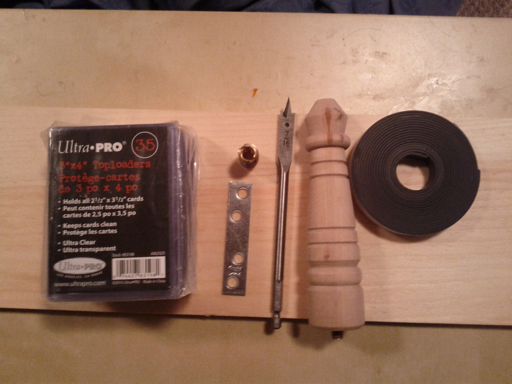 Very few tools are needed for this project – a saw that can do fine cuts (I used a table jigsaw, but a jewellers saw or razer saw would work equally well), a screwdriver, a pair of pliers, a hand drill, and a paint brush! Details of the build can be found below the fold. Assembly is quick, simple and nearly fool-proof. 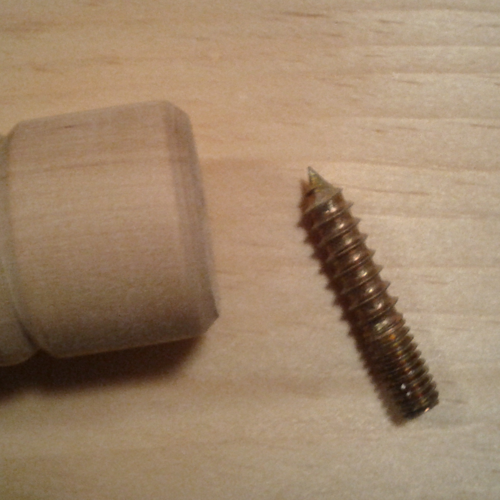 Screw the threaded insert into the enlarged hole, setting it slightly below the bottom of the leg so it is not visible. This insert can be adjusted with a screwdriver later to set the angle of the handle relative to the tap. Using your saw, carefully cut away part of the top of the tap (i.e. 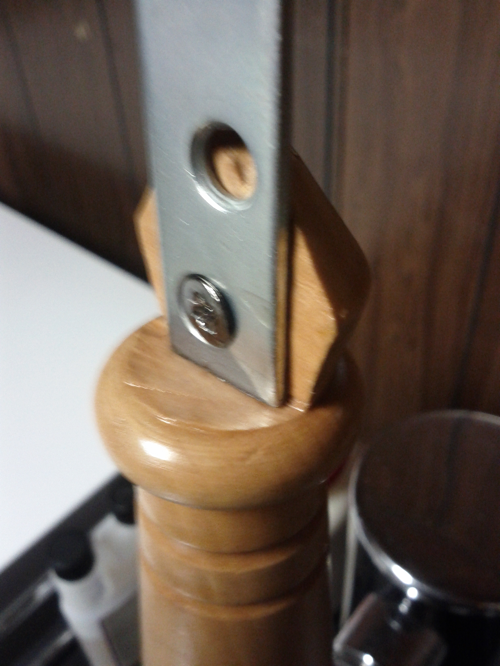 the portion of the table leg that would contact the floor). The goal is to remove about half the thickness of the leg, to create space for the mending plate & for the card-holder to sit upon. Test place the mending plate, and use a pencil to mark the centre of the screw hole. Attach the mending plate by screwing it firmly onto the handle. If you want you can now stain the handles. In my case I liked the natural colour of the wood, so I simply gave the handles two coats of polyurethane varnish over a 24 hour period. Attach a strip of magnetic tape to the back of each card protector. Insert you label and away you go. There are a few options for label lay-outs. While the card protectors hold a 2.5″ by 3.5″ label, I’ve found it is challanging to get this sized label into the holder undamaged & even. 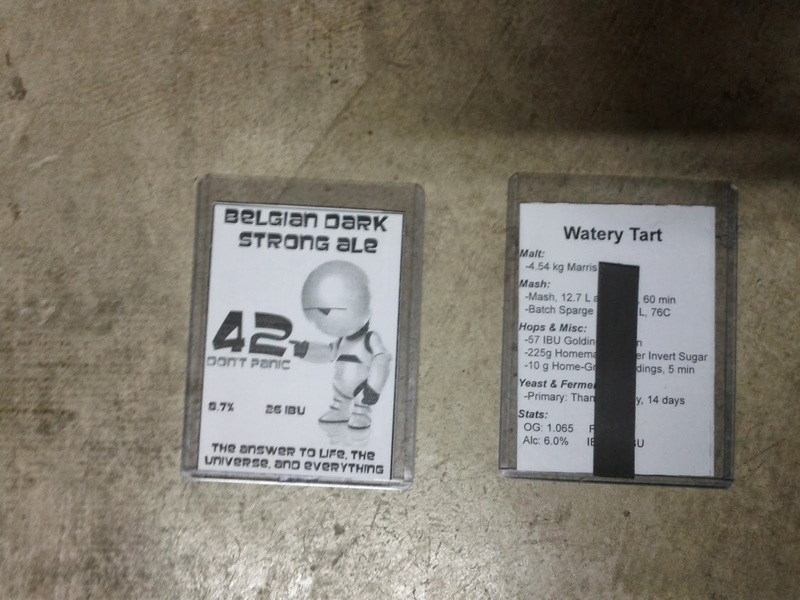 Moreover, the labels can often be hard to read due to light leaking thorugh the label from the back. Instead, I’ve found two designs that provide greater support – as well as make the labels more useful & versatile! A tri-fold model works best. 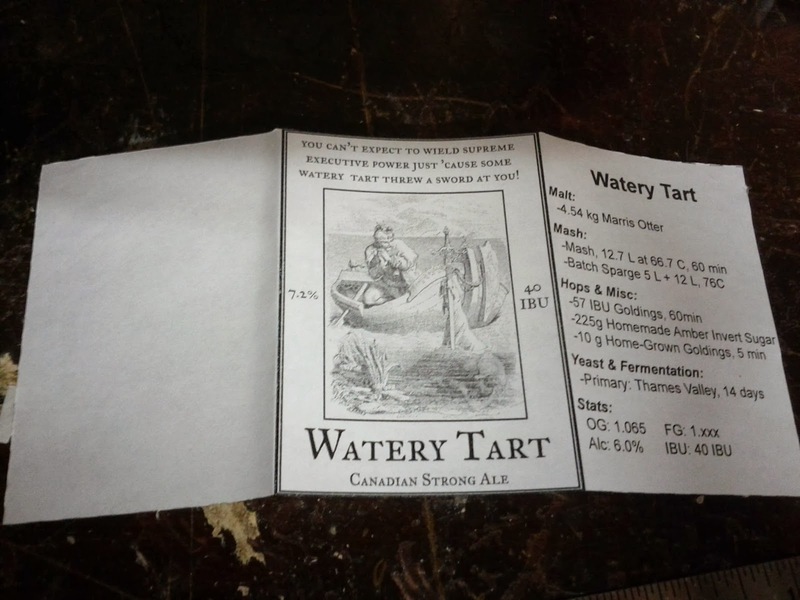 The blank (left) third is folded between the label and the rear (on which I’ve put the recipe, but can be used for other things). This is easily inserted into the card protector, looks great, and prevents any backlight from detracting from the label. This label is 7.5″ wide x 3.5″ tall. A bi-fold model can double as a bottle label, excellent for give-away brews. 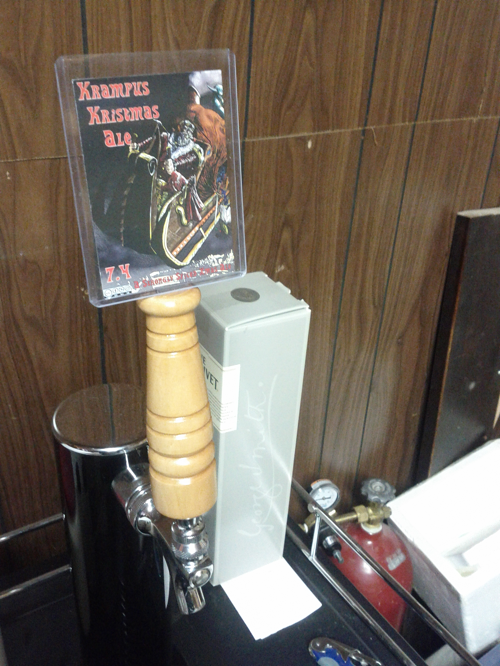 Careful design is needed to make sure the relevant information is on the half of the label visible on the tap handle. If needed, a piece of paper can be inserted between the two halves of the label to reduce backlighting. This label is 5″ wide by 3.5″ tall. Four of these will fit on a single letter-sized piece of paper – providing for efficient use of paper when printing the labels. Emergency Brew Session – Überschuss! Oh my god, 3 years later I just saw this. Awesome riff on my idea. I love the simplicity of it. If I ever decide to "clean" mine up and go thinner, I'm going to go with your solution.